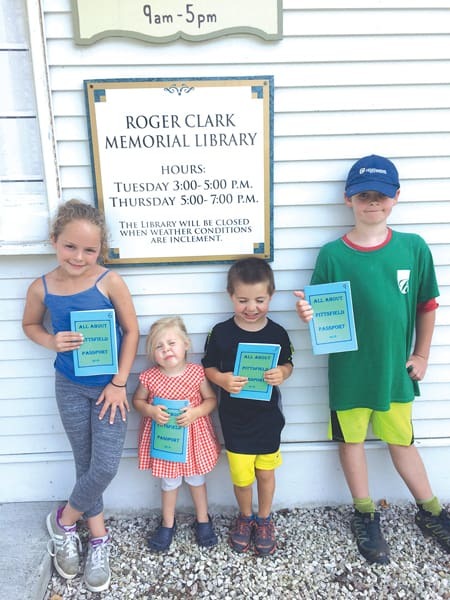 PITTSFIELD—As Vermont’s youth flee, the Roger Clark Memorial Library has a new program to get Pittsfield children interested in the area’s businesses. Pittfield youth are going business to business with a passport and a survey. business owners and ask survey questions such as, “What did you want to be when you grew up?” and “What is your favorite book from childhood?” They also ask what the business does and what education is required. Children have to take a business card, stamp or sticker from the owner to prove they were there. Children get extra points if they know how long the business has been open. “We have a very serious problem in this country and in all small towns in Vermont where we’re going to have labor shortages. I think exposing our youths to the type of businesses that operate can do nothing but help set up a pool of workers,” said Select Board chair Ann Kuendig. Kuendig’s 3-year-old granddaughter, who has already declared she wants to be an astronaut, plans to participate in the program. All About Pittsfield has been a year in the making. The program requires children to speak face-to-face with business owners, something Hurd fears is being lost as youth become more attuned to electronic devices. “I was 9 when I announced to my family I was going to be a hairdresser or veterinarian,” she said. Now, Hurd owns a hair salon in Killington. Hurd’s 9-year-old daughter has said she either wants to be an architect or wants to follow in her mother’s footsteps. Twelve businesses in Pittsfield, from restaurants to architects and hair salons, are participating in All About Pittsfield, including Casa Bella Inn & Restaurant, Clear River Tavern, Deb’s Country Coiffures and Colton Enterprises, Inc.
“Anytime you can get youngsters, no matter how young they are, interested in multiple businesses, I think that’s a great plan,” said Colton Enterprises owner Dan Colton. Colton, who graduated from the University of Vermont, started his own kiln-dried firewood business in 1983. Some of the organizers were surprised how many entrepreneurs there were in town. “We have so many people in Pittsfield that have done something and made a business, a lot of people don’t know about it,” said Coral Hawley, another organizer, whose children, ages 3 and 5, are participating in the program. Children have until Aug. 26 to fill out the survey in the passport. They will receive a prize at the Pittsfield Picnic on that date.